Remember way back in the 90s, when we were listening to the Spice Girls on repeat and sporting pencil-thin eyebrows? Ahh, those were the days. 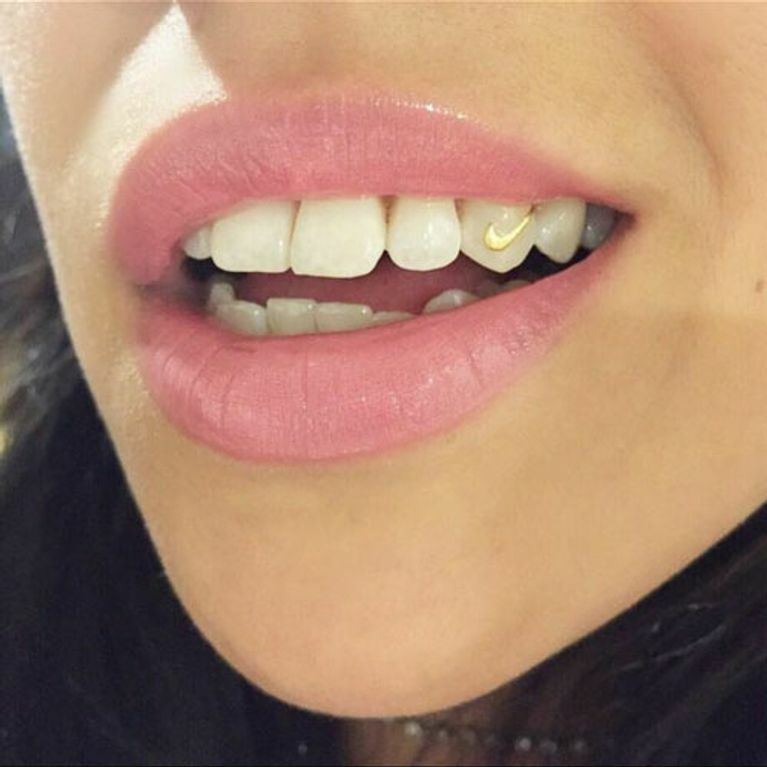 If, like me, you are missing pretty much everything about the 1990s, then don't worry because every single 90s trend is coming back into fashion right now - including tooth jewellery. Which is... weird. We can get on board with plenty of pre-millennial trends - brown lipstick, chokers, space buns. We love 'em all. The tooth gem however, seemed very two-thousand-and-late even then, so its return to mouths in 2017 is... unexpected. The tiny gem, which can come in a range of colours, is attached to the tooth using a strong adhesive. This means that, unless your tooth actually falls out, that gem is going to be in your mouth for a looong time, perhaps longer than you even want it to be. But, like all 2.0 trends, this one's had an upgrade. People aren't just getting a simple gem nowadays - no no, in 2017 it's all about the dollar sign, the heart, the Nike tick. Yeah, ya heard - the Nike tick. Last month at the iHeart Music Awards Katy Perry had one of her canines adorned with a teeny tiny tick endorsement - not to be confused with the quinoa that was stuck in her teeth that no one told her about. Halsey was also seen sporting a gold star on Instagram, whilst model Adwoa Aboah took it to new, classy heights with a miniature Chanel symbol. But no matter how chic the gem, we're still not sure we can get on board with the revival of this trend. Having said that, we're fully aware that in a couple of months we'll probably be adorning every tooth with a tiny shiny rock. That's fashun for you. The Good, The Bad, The Ugly: Why Were We So Obsessed With These 90s Trends?